“Horizon” Cuff Bracelet. $425. SOLD. The horizon divides earth from sky, but does not interrupt the light. Wings pays tribute to all three cosmic spirits with this hand-milled sterling silver cuff. The band is twelve-gauge silver, solid and substantial but not heavy, filed and buffed to a silky smooth finish on the underside. Across the top, the silver is coaxed into sharp relief in a single “horizon” line that runs its entire length, just slightly off-center: broader expanse of silvered sky above, a more slender slice of shimmering earth below, all polished to a glowing mirror-like finish. 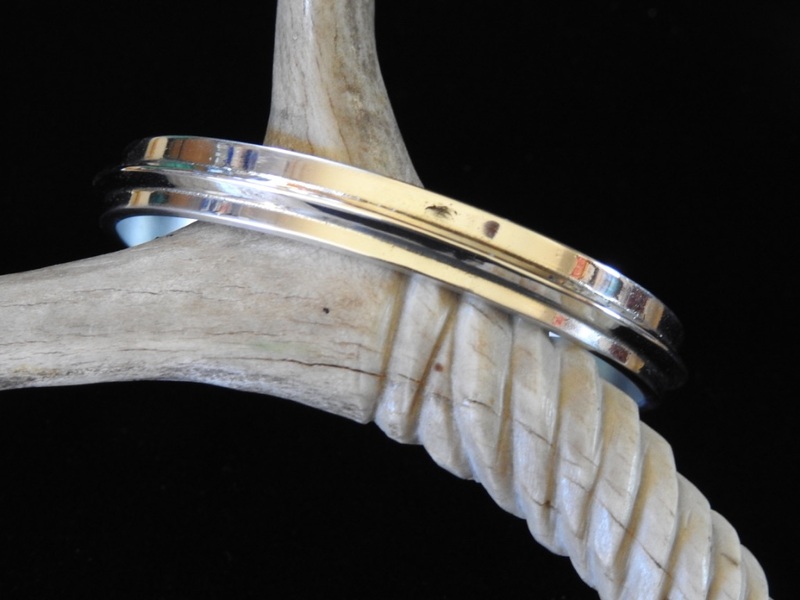 Cuff is 6-1/4″ long by 5/16″ across (dimensions approximate). Posted on Tuesday, November 13th, 2018 at 1:54 pm. Filed under: Bracelets, Cuffs and Links and Bangles	RSS 2.0 feed.